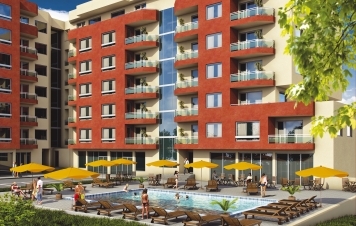 We present the first in Stara Zagora residential complex of closed – type with a swimming pool – Trakia . The well-organized building comprises of 87 apartments , 12 commercial premises , swimming pool and parking zone . In favor of the comfort and the good life style , complex Trakia offers to its inhabitants exclusively pleasant atmosphere in the internal yard and exciting moments for the whole family around the attractive swimming pool , 24 hours security , safety zone for children games . .
Trakia is situated in one of the most rapidly urbanizing regions of Stara Zagora – district Zheleznik – West . The place provides tranquility for its guests , in the foots of the Sredna Gora Mountains , away from the town noise , altogether with the nature and the crystal clean air . Meanwhile , the location of the Trakia complex is very well connected by different kinds of transport . At the south direction from the complex is situated the main road Sofia – Plovdiv , but at the north direction – the well – known for everyone spa resort “Stara Zagora Mineral Spa”. In close proximity to it is the famous hypermarket “Praktiker” . Complex Trakia expects its new occupants with a number of advantages at reasonable prices .